The other day I spent the evening rewiring some racks in our datacentre, mainly I was replacing our old, unmanaged, PDU-strips from Bachmann with new, managed, ones from APC. The goal was to keep better track of powerusage and get more outlets in our racks. Standing there I realized the development in cable usage in our datacenter over the last few years. 10 years ago most servers were 2-8 U and had a single PSU and a single network cable attached to it and that was it (this was before we had KVM systems in place - go-go console cart). 5 years ago every server were like 2-4 U, had redundant PSUs and two network cables (one for public services and one for doing backups) and 3 cables for KVM (VGA, PS/2 keyboard and mouse). Yesterday, looking at our latest servers, 1-2 U, still redundant PSUs (2 cables), KVM (2 cables, now VGA and USB) and ...up to 11 network cables (VMware ESXi servers using 2 on-board network ports, two 4-port network cards and a CIMC port. Madness! This means that in the space of half a rack of 15 servers we have, not counting switches and other infrastructure, 30 powercables, 30 KVM cables and 165 (!) colour-coded network cables (more about those colours some other time). Keeping it tidy and neat is a full-time job I tell you! 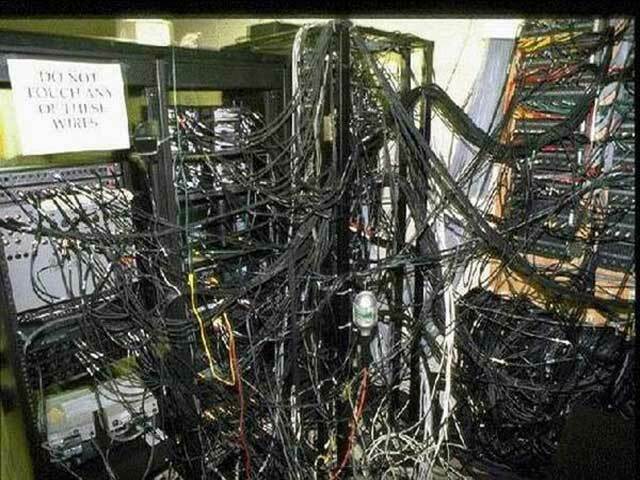 Disclaimer: the picture is not of our datacenter, I found it on the next when googling for "datacenter cable management" ...and scary as it looks I have seen worse when visiting clients at times.